Running watches aren’t new technology, but they’ve traditionally been cumbersome and slightly erratic. 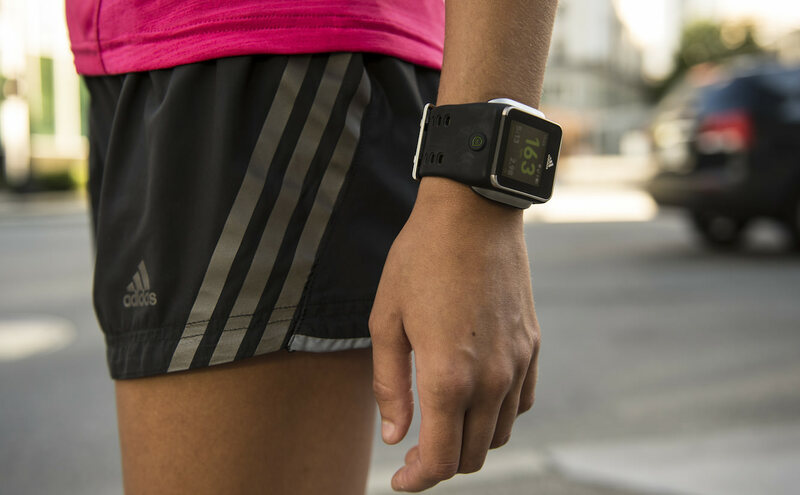 The Adidas miCoach SmartRun is out to streamline the design while adding in easy-glance graphics, a touchscreen and integrated heart rate monitor to give all the essential info while you’re pounding the streets. However, with all of that tech running in a small wrist-based space, the battery is going to be worked hard, and is a touchscreen really what you need on a such a compact device? We check it out in our Adidas miCoach SmartRun review to see how it fares against it fitness-based rivals. There are two categories of running watches: those that favour function over form, and those that try to compete with your daily timepiece for wrist space. SmartRun lives mostly in the former, but still managed to pick up the Red Dot design award to show it doesn’t look out of place in for either task. It’s still a larger watch, with the flared base (necessary to enhance the optical heart rate sensor’s accuracy) adding to the heft. However, it does give a more striking design than the simple black square most running watches go for. In terms of features, it’s pretty well-packed, with the aforementioned heart rate monitor, GPS, MP3 player (there’s a discrepancy on the amount of internal space available for your tunes, but at between 3-4GB you’re going to have plenty of space for your playlists) and stopwatch, alarm and timer. The 1.45-inch display is clear and crisp in most light, making it easy to see, but the small touch-space (presumably for aesthetic and battery reasons) can be very hard to hit, especially at pace. The key thing isn’t the spec list though: it’s whether the SmartRun can actually help improve your running. Well, we found it can in a number of ways, thanks to the inbuilt heart rate monitor (removing the need for restrictive chest strap) and the option to program in your own training plans, with the watch reminding you daily of what’s on the agenda. It doesn’t stop at running either, as the SmartRun can also give you strength workouts to help improve your technique, with animated demonstrations something that the colour LCD is able to offer over its monochrome rivals. When out running, you’ll be guided through four coloured zones, from warm up to all out effort (these are divined when you perform an initial 12 minute set up) – and you can choose between heart rate and pace as to what information is most prominent on the screen. However, this only relates to the any scheduled workout you’ve set up already – decide to do a Free Workout with no set time or distance (as many will often do), and you’ll be forced to see heart rate front and centre, with the pace locked away in a small corner. Adidas has been steadily improving the SmartRun since its launch, and recent updates have added in GPS smoothing, meaning your pace will stay more stable as you speed up and slow down. This is fine if you’re one to run at a steady pace, but doesn’t work as well for interval (varying speed) training, as you’ll need to wait a lot longer to see how fast or slow you’ve become. That said, the constant updates largely have brought big leaps forward for the SmartRun, and with more coming (Spotify integration is being considered, for instance) if there’s a feature that rankles now, there’s a good chance it will be improved in the future. One of the key selling points of the Adidas SmartRun is the fact it’s designed to sync with the web portal, giving you the chance to set your goal as anything from getting off the couch and out in the fresh air, to finishing a marathon faster, to getting better at a multitude of sports. Each category has multiple effort levels within it too, allowing you to select the one most appropriate and sync it to the watch. Setting this up will also allow send the same information to the miCoach app on your smartphone, allowing you post run to see charts of your speed improvements and mile speeds. However, only recently have the watch and smartphone started to play together – before you had to get the SmartRun into a known Wi-Fi zone (with secure connection) to upload your stats, as you can’t view the information above on the smaller screen. You can now use your phone’s internet connection to send the info up to Adidas’ servers, but this requires a fair amount of setting manipulation, and is miles away from the notion of being able to see messages and calls on your SmartRun if you’re carrying your phone with you too, which some might expect from a watch of this price. Similarly, there’s a discrepancy between the plans you can set up from web to watch (for instance, you can create your own interval workout on either platform) but while the web allows you to choose multiple speed flavours (a warm-up, followed by sprints, followed by a medium jog) the watch allows only two levels. But the SmartRun will let create up to 99 repeats of said intensities on the device itself, where the web restricts you to six. It’s a long way from a deal breaker, but we do feel the two should marry up a little better. Now, we come to the bug-bear of the SmartRun. At launch, it was a watch barely worth reviewing, almost unable to track a short exercise stint without running out of juice before the first heavy breaths were flying – and a marathon was a distant dream. Subsequent updates have improved things enormously, meaning you can track two or three medium-to-long runs before it conks out. Marathon mode is now enabled as well, which means the GPS will be less detailed but subsequently pulls a lower drain from the battery. If you can bring yourself to clip it to the external dock every night, it’s even useable as a daily time-giver – however, we still feel that the battery leaves something to be desired as if you leave it on standby overnight and don’t charge, chances are it won’t be up for a morning run, leaving you frustrated since you’ve become dependent on technology to help you exercise.